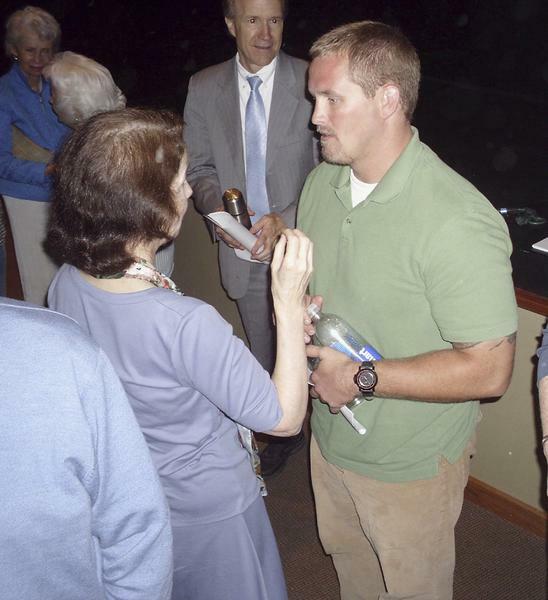 Saturday’s forum in Fairfield about posttraumatic stress was a kick-off to promote the need to equip today’s military with more tools to increase resiliency, said Chris Busch, program director at the David Lynch Foundation. “We need to establish resilience in our warriors, not only for combat,” Busch told the audience of about 200 people attending Healing the Hidden Wounds of War Fairfield Arts & Convention Center’s Stephen Sondheim Center for Performing Arts. Another TM study is under way at Norwich University in Northfield, Vt. A private university founded in 1819, Norwich is the birthplace of Reserve Officer Training Corps. Military cadets volunteered to learn Tanscendental Meditation last school year. Busch shared a video about the study, including feedback from the student soldiers who have practiced TM since autumn. Cadets in the video speak about heavy class loads, being in leadership positions of responsibility and being tired; tired muscles, a tired mind and falling asleep in classes. Meditation brought noticeable change — in being more alert and muscles relaxing during meditation and experiencing a rejuvenated mind. One student cadet said a difference he sees in his meditating platoon versus non-meditating platoons, is his “platoon is more professional, ‘more locked-on,’ they’re not joking around. A freshman cadet said, “We’ve picked up a reputation on campus as ‘those weird people that meditate.’ I kindly point out to them the fact that we don’t fall asleep in class, we’ve got better PT [physical training] scores, we do better on tests, we have better uniforms, we don’t get yelled at as much as they do, and then they quiet down pretty quickly after that. A female senior cadet said in the video she was at first a skeptic. “ROTC commissions 70 percent of all the officers of the United States,” said Schneider, who with other administrators at Norwich learned TM a short time prior to the cadets’ learning. The five-minute, 13-second video is available on the David Lynch Foundation website. Two of the main speakers Saturday were veterans Jerry Yellin and Luke Jensen. Yellin, now a Fairfield resident, was a young World War II fighter pilot, who suffered from PTSD for 30 years before learning TM in 1975, “which genuinely saved my life,” he said. “I’m here today to offer scholarships to any veterans, and their families, who want to learn Transcendental Meditation,” said Yellin who co-chairs the Warrior Wellness program begun in 2010, supported by the David Lynch Foundation. He related his own story, including his wife’s support. Yellin and Helene married in August 1949. He also introduced Jensen, 33 years old: “No one understands combat like a combat veteran. I’m pleased to introduce my hero, Luke Jensen,” said Yellin. Jensen, an Iowa native living in Story County, had deployed to Afghanistan in August 2009 as a member of the Army Reserves. He began experiencing severe stress, panic attacks, depression and suicidal thoughts shortly after arriving in Afghanistan. A story in the Des Moines Register published a year ago, detailed Jensen’s struggles and life back with his wife and two young daughters when he returned home. Yellin had read that story last summer and called Jensen at work the next day and offered David Lynch scholarships to Jensen and his wife, Abi, to learn TM. Saturday in Fairfield is the first time Jensen has told his story to a live audience. A video with the Jensens was created prior to Saturday, which told some of their story. Jensen recounted his story, from aspiring to work in law enforcement and fulfilling that in 2001, to daily suicidal thoughts and drinking to self-medicate in 2010 and 2011. His voice sometimes shook from nerves or emotion. He used the word “ashamed” frequently. “TM helped my family come out of darkness, it brought me relief and gave me hope for the future,” said Jensen. At Healing the Hidden Wounds of War forum, Jerry Yellin, told about his inspiration to ask for a division of Operation Warrior Wellness to teach Transcendental Meditation to help military veterans. It came from a personal experience, a tragedy of another soldier’s family that had Yellin pursue a program to help veterans. “I asked what was the cost of current treatment for veterans with post traumatic stress when I met with the deputy of the V.A. administration,” he said. The 2006 and 2007 Veterans Affairs cost of mental health support to veterans of all wars, was $15 billion and $18 billion, said Yellin. That provides an economic motivation to have Transcendental Meditation programs available on a large-scale basis for veterans, he said. Fred Travis, a Maharishi University of Management professor and director of the Center for Brain, Consciousness and Cognition, also said larger-scale TM programs are needed for veterans. “The Veterans Administration will approve TM for a veteran on a one-at-a-time basis,” he said. Travis explained how post traumatic stress works on the brain. “The Amygdala part of the brain tags important events to file away in your memory,” he said. “It tags each detail; it’s permenantly stuck on. Every experience is tagged with strong emotion. “Post traumatic stress is a natural reaction to unnatural events. So once all these events are tagged with strong emotion, the person now feels they have to be completely in control. You experience hyper-vigilance and can’t rest. We also know from research that when someone is experiencing PTS, the brain’s frontal lobes turn off. The frontal lobes are the ‘CEO’ of the brain. When it’s not functioning properly, you don’t have the brain power to find a solution; you only see the problems,” said Travis. FAIRFIELD — Military police sergeants, civilian police officers and SWAT team members are all supposed to be tough. Luke Jensen was all three, so when the stress of combat began eating away at him, he felt so ashamed, he wanted to die. Meditation helped correct that desire — and he believes it could help other soldiers and veterans. Jensen was asked by Operation Warrior Wellness to speak about his experiences with post traumatic stress disorder (PTSD) during a presentation Saturday on PTSD, the military and the advantages of Transcendental Meditation. “The medical [tents] in Afghanistan were for 10th Mountain Division soldiers who’d been wounded in combat,” said the Nevada, Iowa man. How could he possibly walk into that tent and tell a medic that he was sad? He told the Fairfield audience that his base was hit their first night there. Gunshots, explosions and outgoing fire were nearly constant. And the things he saw around him were worse than he felt he could handle. He couldn’t sleep, he was having panic attacks and in addition to worrying about himself, the staff sergeant had his men to lead. “I thought I was tough,” he said. But in a combat zone, his world was out of control. When sent to investigate a report of a little Afghani girl struck by a U.S. vehicle, he found the child dead near the road. The upset family came to claim her. Jensen contacted the Army’s Criminal Investigation Division then kept people from walking onto the death scene. He had no translator. The locals were getting angrier and more numerous, not understanding why this armed foreigner would want to keep the girl’s body from her family. Later, someone — Jensen never found out who — ran over and killed a nearby U.S. serviceman. His nerves couldn’t handle any more. As soon as he was able, he decided to take his sidearm and shoot himself dead. When health personnel he’d sought out heard about his attempt, he was evacuated — which made him feel as though he’d failed in his duty. At least he could move on with his life. So why did he keep thinking the most logical step would be to take his own life — even when back in the U.S.? He still couldn’t sleep. He still had panic attacks. And he felt a deep sense of shame — especially because while on a U.S. base receiving medical care, he saw the other soldiers who had “real” injuries. Dr. Fred Travis, a psychologist in Fairfield, said PTSD produces an injury as real as any wound. Travis is the director of the Center for Brain, Consciousness and Cognition at Maharishi University of Management. CAT scans of patients suffering from PTSD, he said, provide evidence that the brains of sufferers are different from those without PTSD. The effect is physical. But Jensen didn’t know his brain was short circuited. He was taking medication for depression and anxiety, back in Iowa working in law enforcement. He still wanted to die. When his police supervisors heard he was suicidal, they began proceedings to terminate him. “Jerry Yellin saved my life,” Jensen said. Yellin was a World War II fighter pilot who went undiagnosed with PTSD for 30 years. Transcendental Meditation was what helped him find relaxation and peace. When he heard about the young soldier, he called him. Yellin got support from MUM and the David Lynch Foundation in order to provide a sort of “scholarship” for Staff Sgt. Jensen and his wife to learn TM. Jensen thought it’d be worth a try. He had recently made a suicide threat, loaded gun to his head in front of his wife and five-year-old daughter. The trip to Fairfield was worth it, he said. He learned to find quiet in his mind, which allowed him to relax peacefully for the first time in a long time, he said. Dr. Travis said what appears to be happening with PTSD is that in a combat zone, the mind naturally must be super vigilant. One needs to be able to see every danger, lock that sound or sight into the memory — and avoid it. With PTSD, every similar noise or sight becomes a life-or-death situation. Memories of danger are “locked” into the brain. Worse, parts of the mind are “short circuited” so that while the “problem-seeing” part of the brain is stuck in the “on” position, the “problem-solving” part of the brain is off. Desperation develops when all you see are problems — problems with no solution. By meditating, TM practitioners are trained to go around that damaged part of the brain, Yellin said. In a video about their situation, Jensen’s wife said TM saved her husband’s life. Yellin wants more soldiers to have that opportunity, and is working with the David Lynch Foundation as co-chair of Operation Warrior Wellness. Like other parts of the body, the brain responds to exercise, becoming more resilient. “If your frontal lobes are more developed, we believe you will be better able to deal with stressful situations,” said Travis. Presenters said practitioners of meditation are also better able to separate the quiet of inner peace from traumatic situations in the outside world. The military is starting to take notice, as is the Veterans Administration. Chris Busch, director of programs for the David Lynch Foundation, said the VA has commissioned two large studies to see if TM really shows results. TM is not a replacement for traditional medicine, he said. It can be, however, one of the options doctors offer mental health patients on their way to recovery. Yellin said Saturday’s event was the start to an effort to provide scholarships every veteran who needs TM. For more information, visit www.operationwarriorwellness.org. Also published in Journal Express of CNHI/SE Iowa. FAIRFIELD, IOWA — It’s called Operation Warrior Wellness. It is helping war veterans of all ages with Post Traumatic Stress Disorder (PTSD) regain control of their lives through Transcendental Meditation. “He was the comedian. He was very fun, loved his job, loved his family — very outgoing and just very involved in everything,” said Abi Jensen, wife of a war veteran. Abi Jensen spoke about what her husband Luke was like before he was deployed to Afghanistan. However when Luke returned from war, it was a very different story. “He was very angry, very anxious about every situation — social situations, even quiet time at home — he was just, couldn’t ever really relax. Everything caused him anger and anxiety,” said Abi. Luke Jensen knew he needed to reach out for help when he a hit a breaking point in his life, one neither he nor his family would ever forget. “One night I drank too much and I actually punched holes through the walls of my home. I pointed a loaded gun at my head in front of my wife and children. And that was — the next day I knew I totally crossed the line and I needed to get help now,” said Luke Jensen. And that’s where Jerry Yellin came in. Yellin is a WWII Veteran and was suffering from PTSD until he discovered Transcendental Meditation. Yellin happened to see a front page newspaper article on PTSD featuring Luke Jensen’s story. “And I spoke to him — told him who I was and what I had been through and what I was doing now. And I asked him if he would come to Fairfield and learn Transcendental Meditation, when he did last August, early August and he got his life back,” said Yellin, Operation Warrior Wellness. “If you don’t want to do it for yourself, if you’re not willing to get help for yourself, do it for your family. If you love your family, love your children — they don’t deserve to go through stress and anxiety because of, because of your experiences,” said Luke. One veteran says he’s finally found a way of dealing with his Post Traumatic Stress Disorder after serving in Afghanistan. And, he wants to share his story to help other warriors heal the hidden wounds of war. Jensen will share his story Saturday afternoon. All Iowa veterans are invited to attend with their families. Veterans will learn more about a program called Operation Warrior Wellness that offers scholarships for veterans to learn Transcendental Meditation. The seminar is Saturday, July 28 at 2 p.m. at the Fairfield Arts and Convention Center. You can find information at www.operationwarriorwellness.org/iowa. Veteran Meditation video published on Jul 27, 2012 by WHOHDVideo. Link to article: http://bit.ly/PJehMh. Luke Jensen was in bad shape when Jerry Yellin reached out to him last year. Jensen, a 32-year-old U.S. Army Reserve veteran of the Afghanistan war, was suffering from post-traumatic stress disorder. He yelled at his wife and two daughters. He stormed about his Colo home. He rarely slept. He drank until he passed out. He overdosed on his anti-anxiety medication. One dark night, in front of his youngest daughter and wife, he held a loaded gun up to his head. Also an Army veteran, Yellin contacted Jensen after reading a profile in The Des Moines Register last year detailing Jensen’s struggles. Yellin, a New Jersey native who lives in Fairfield, told Jensen he felt the same way after his World War II service. Yellin, 88, had lived with suicidal thoughts and anhedonia — an inability to experience pleasure from usually enjoyable activities — for 30 years until he and his wife, Helene, discovered Transcendental Meditation. The pair seek to bring their message to more veterans Saturday in Fairfield. Both will speak at “Healing the Hidden Wounds of War” at 2 p.m. at the Fairfield Arts and Convention Center. The seminar is free. Scholarships also will be awarded free of charge to veterans and their spouses to learn the technique and practice it for six months. The event is sponsored by Operation Warrior Wellness, which promotes Transcendental Meditation to veterans struggling with their experiences in war. Operation Warrior Wellness is sponsored by filmmaker David Lynch, known for the TV series “Twin Peaks” and “The Straight Story,” a film about a man’s journey from Iowa to Wisconsin to visit his estranged brother. Transcendental Meditation is based on an Indian philosophy that trains the mind and consciousness to realize a benefit by focusing on a mantra, a meaningless word that helps bring about calm and reduce stress. The technique dates back more than 5,000 years, but it became especially popular in the U.S. during the 1960s when championed by charismatic guru Maharishi Mahesh Yogi. Iowa and meditation have a long history. Followers established the Maharishi University of Management in Fairfield in 1974, considered the world’s largest training center for the technique. The U.S. Department of Defense does not specifically offer meditation technique, though officials are not opposed to the practice as a way to mitigate PTSD and other war-related disorders. Some skeptics dismiss the technique as hokum, but Yellin and Jensen believe their meditation has alleviated years of struggles. Yellin got into the technique after his wife, Helene, saw the Maharishi on “The Merv Griffin Show” in 1975. The couple lived in Florida at the time and called a local Transcendental Meditation teacher. In the years after the war, Yellin struggled to work. He held as many as 30 jobs. He worked for his wife’s father several times. His office was in a nine-story building and he often thought about jumping to his death. The meditation, Yellin said, helped him process decades-old memories from the war. He flew strafing runs to support U.S. Marines on Iwo Jima, where 7,000 Marines and 21,000 Japanese soldiers died. He carried a hatred for the Japanese people until 1988, when one of his sons married the daughter of a former Japanese Zero pilot. The meditation helped him make peace with his memories and become a better husband, father and now grandfather, he says. Oddly, Yellin said the feeling he gets when he meditates is similar to the feeling he got when he flew fighter planes. The same warrior’s technique also helped Jensen make his peace. He and his wife, Abi, both practice. After returning from service, he couldn’t sleep despite a regimen of pills specifically prescribed to make him drowsy. Both Jensen and Yellin acknowledge some skeptics doubt Transcendental Meditation. Some worry the practice will interfere with their religion. Yellin, however, said his meditation makes him a better Christian. For more information on Operation Warrior Wellness, visit iowaveterans.eventbrite.com. Great article! Keep writing about these veterans returning back from combat zones and how difficult it is to transition into a normal lifestyle. Once you keep raising awareness, the “Investment” will be forced on politicians to continue the promises of CARE they are planning to cut from these traumatized citizens. Ask those people in that Aurora theater how long it will take to recover from the incident of that gun fight and you can get a basic understanding of a veteran leaving a normal family and spending a YEAR’s worth of those days living like that and then being expected to act “normally” like nothing happened. Then when they need help, a government tells them that they should look elsewhere because it is not in the defense funds anymore (even though they put them there in the first place). I have spoken to a number of veterans who have learned the TM technique and their stories mirror the stories told here. I encourage all veterans, men and women, to take advantage of this opportunity. Also posted on DefenseTracker.com: Meditation Helps Reservist Heal and Wounded Times Blogspot and Altoona Herald-Index. Opening Fairfield Doors with Connie Boyer. In Episode 5, Connie talks with WWII Captain (Ret) Jerry Yellin about his war experiences, his feeling lost after the war, multiple jobs, learning the Transcendental Meditation technique, which helped him get his life back, and his eventual return visit to Japan with his wife, Helene. They liked it so much they sent their son, Robert, to visit Japan after graduating from high school. He ended up teaching English in Japan and never came back. He married a Japanese girl, which forced Jerry to reconcile with his enemy, now family. Jerry Yellin wrote several award-winning books about his experiences in Of War and Weddings, The Blackened Canteen, The Letter, and The Resilient Warrior: Healing the Hidden Wounds of War. Today Jerry is co-director of Operation Warrior Wellness. Last year he read about Luke Jensen’s battle with PTSD after returning from Afghanistan, and offered him a scholarship from the David Lynch Foundation to learn Transcendental Meditation. It transformed his life. Now Jerry and Luke are offering an open forum to all Iowa veterans and their families to learn TM and get their lives back. See the articles and videos listed below for more information. Those interested in attending the forum, Healing the Hidden Wounds of War, this Saturday, July 28, 2 pm, at the Fairfield Arts and Convention Center, can register at www.operationwarriorwellness.org/iowa. He returned to his civilian life, but he found his PTSD symptoms so debilitating that after a night of drinking he swallowed all the medication he had. “I thought it would be the easy way to go,” Jensen said. Jensen swallowed pills hoping to die from an overdose, but he survived. On another occasion, he pointed a gun at himself, but he stopped himself from pulling the trigger. His family convinced him to seek additional help and eventually he found some relief through transcendental meditation. “This is the first thing that gave me relief,” Jensen said. 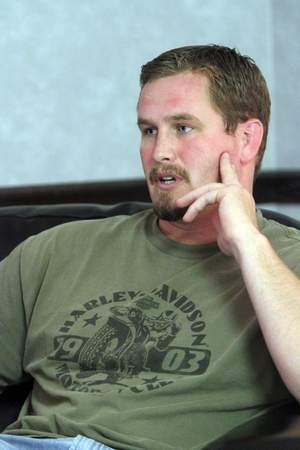 Jensen plans to share his full story 2 p.m. Saturday in Fairfield at a seminar called Healing the Hidden Wounds of War. 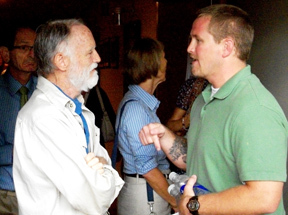 The event is an open forum for Iowa veterans and their families affected by PTSD. Jensen is still here to tell his story, but the U.S. Department of Defense released figures in June showing that 154 active duty troops committed suicide in the first 155 days of 2012, as reported in many media outlets including the LA Times. One a Day, a term once used to describe the loss of WWII veterans as they grew old, now quantifies the suicide rate among American active duty troops. As a reminder, Time Magazine’s “One a Day” cover is taped to a file cabinet in the Story County Veterans Affairs Office where Jensen now serves as an office coordinator. Self-inflicted deaths have surpassed casualties on the battlefield. “It’s a problem on the rise,” Jensen said. The former undercover police officer said he was ashamed to admit he had a problem at first. “No one thought I would be the one to have a problem. I was the guy cheering everyone up,” Jensen said. He’d seen dead bodies as a police officer and though he investigated cases in dangerous places as a military police officer he never faced fire. He couldn’t understand why he would have a problem. Seeing dead servicemen wearing the same uniform as him had a different impact. He thought his own death was inevitable and thought about suicide during service. Jensen tried a number of therapies including individual and group therapy and a rapid eye movement technique. He shared his story with the media in 2011, because he was upset. He’d been fired from his job with the Story County Sheriff’s Office and he felt that the Army was failing to deal with the suicide/PTSD problem and that civilians didn’t know how to deal with it. Jerry Yellins, co-director for Operation Warrior Wellness, read Jensen’s story and offered him a scholarship so that he could learn Transcendental Meditation, something that had also given Yellin relief. Jensen learned the meditation technique over a weekend in August 2011 and said a month later he was able to stop taking his anxiety medications. He practices the technique daily spending about 20 minutes before and after work in a quiet place to focus on his mantra. He compares it to taking a power nap. Jensen has since been given a new job with the county at the veteran’s affairs office but will never be able to resume duties as a police officer. PTSD symptoms can improve, but the diagnosis is for life. Jensen said the military is researching treatment options and seems open minded. “They still have not found a solution, I’m trying to give another option that’s out there,” Jensen said. Transcendental meditation is just one thing that could work, he said. Learning the technique is free to veterans thanks to scholarships through the David Lynch Foundation. “This is well worth your time. If it doesn’t work, time, is the only thing you are out of,” Jensen said. Two U.S. Army veterans, more than five decades apart in age, and a five-wars-with-U.S.-involvement difference, will share their stories and their experiences in making peace with the effects of war and combat, in the hope of reaching other wounded veterans. World War II P-51 fighter pilot, Fairfield resident, author and co-chair of Operation Warrior Wellness, Jerry Yellin and Luke Jensen, a 12-year Army Reserves Military Police soldier, Operation Enduring Freedom/Afghanistan veteran from Story County will join in a public forum at 2 p.m. Saturday at the Fairfield Arts & Convention Center. The forum, Healing the Hidden Wounds of War, is open to everyone at no charge. Another chilling statistic: More soldiers have died by suicide than have been killed in combat in Afghanistan. “A representative from the Surgeon General’s office is coming to our forum in Fairfield,” said Yellin. Yellin and Jensen are authorities on the effects of combat stress and Post Traumatic Stress Disorder. Yellin describes suffering from it for 30 years; Jensen is healing after struggling for nearly two years. Yellin tells his story in his published book, “The Resilient Warrior.” He was 17-years-old on the day Japan attacked the U.S. navel fleet at Pearl Harbor, Dec. 7, 1941. “It felt as if someone had invaded my home, and I had to do something about it,” he wrote. And he recites the 16 names beginning 69 years ago, how they died and when they died. Yellin flew 19 long-range bombing missions over Japan from his base in Iwo Jima, in the company of 11 “other young pilots, all of them friends,” none who lived to return home. But he returned home, to New Jersey, in December 1945. In his book, he describes himself as a former captain, a combat squadron leader, and a fighter pilot, but “emotionally I was just a 17-year old high school graduate. I was a lost soul, with no one to talk to and no real life experiences to fall back on,” he wrote. “During the war, I had a purpose, it was clearly defined,” said Yellin from his 88-years’ perspective. “When I came home, I was completely empty. “I developed an addiction — to golf,” he said. “I had no interest in working, no interest in furthering my education. His wife Helene saw Maharishi Mahesh Yogi on the Merv Griffin TV show in 1975, and became interested in learning TM. After his wife and one of his sons learned, Yellin also decided to take the TM course. 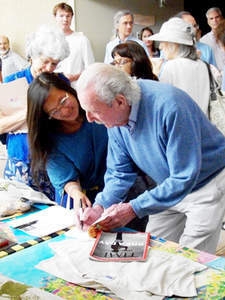 “Thirty years after World War II, I found TM could take my stress away,” said Yellin. His other three sons also learned and eventually, the family moved to Fairfield. Since 2010, Yellin has been on a mission to help veterans, and their families, from any wars, learn TM to relieve stress, he said. “I don’t want other veterans to go through what I went through,” he said. Through Operation Warrior Wellness, supported by the David Lynch Foundation, offering this help, learning TM, is given at no cost to veterans and families. Yellin has spoken about PTSD and TM in New York, Washington, D.C., South Dakota and Los Angeles. But it isn’t only from the podium to large crowds he makes his appeals; Yellin also deals up close and personal. A year ago, his son brought home the Des Moines Register with a front-page story that grabbed Yellin’s attention. Des Moines Register writer Reid Forgrave wrote about Jensen, who grew up in a loving family, always wanted to be in law enforcement and joined the Army Reserves after high school. The news story tells about Jensen’s hiring at the police department in Nevada, Iowa, in 2001, his yearlong deployment after 9/11 to seaports around the country, then upon returning, his advancement in local law enforcement. He worked on the Central Iowa Drug Task Force as an undercover cop, making drug buys, drug busts and felony arrests. By 2009, he and his wife had two young daughters. His unit was called up to deploy to Afghanistan. He wasn’t looking forward to leaving his family, but it was his commitment and he would be deploying with his close-knit group of military buddies. But then, just before the unit left the states, the mission changed and the unit was split into smaller groups and dispersed to seven separate bases. Jensen experienced soldiers dying and artillery fire shaking his bed day and night. Within a month, he felt defenseless, helpless, sleepless and eventually hopeless. He lost 25 pounds and experienced panic attacks all day long. He sweated profusely and was depressed. After 53 days he was medically evacuated. Going through seven weeks of therapy at Fort Campbell, Ky., before returning to Iowa didn’t help. Relaxation classes, yoga and prescriptions didn’t help. One April night in 2010 Forgrave wrote, Jensen finished drinking a 12-pack of beer and argued with his wife. He got his 45-caliber pistol and “stalked around his house, crouched toward the floor, making strange noises. ‘You don’t know what I’ve seen!’ he screamed at his wife” at 3 a.m. When she said she was calling police, after locking herself and daughters in the bathroom, Jensen screamed he’d kill himself, wrote Forgrave. That one-night crisis de-escalated, but Jensen was still very unbalanced. Then he lost his job as a Story County deputy. The family started going in debt. Jensen vacillated between not sleeping and sleeping all the time. His blood pressure, at age 32, was very high. He was put on blood pressure medication. And he kept thinking about suicide, something he hadn’t really stopped thinking about since serving in Afghanistan. He continued with counseling therapy and took a job in Story County Veteran Affairs Office, helping other veterans access services and file claims. He was making improvements, accepting his war experiences and his mental breakdown from it. That’s the story Yellin read in the newspaper last summer. The following day, he called Story County Veterans Affairs Office and asked for Jensen. It was all paid for through Operation Warrior Wellness. Jensen said in the year since learning TM he has been able to get off his anxiety medications and sleep-aides, lower the doses on his blood pressure medication and depression medication. “I’m sleeping much better,” he said. “I’m attending night classes through William Penn University, studying business management. Abi also appreciates Yellin’s outreach. “I felt we had a lot of support from family and had close military ties with Luke’s unit. I thought when he came home, we’d just go back to our former lives,” she said. “Even though I knew he had suicidal thoughts, I thought all that would go away once he was home again. I thought I was strong enough to overcome all of this. “I didn’t want to know about all the hidden wounds, I didn’t want Luke to be changed,” she said. “One thing I’ve always adored about Luke is he’s a very tender, loving father. She said learning TM over a weekend last summer, gave her hope. “We prefer if people register at www.operationwarriorwellness.org/iowa if they are attending,” he said. Along with Luke Jensen and Jerry Yellin, Fred Travis. a professor at Maharishi University of Management and director of the Center for Brain, Consciousness and Cognition, will present information at Saturday’s forum, Healing the Hidden Wounds of War. Travis is a published researcher about the functions of the brain and effects of Transcendental Meditation on the brain. “The main point to remember, is experience changes the brain,” he said. That is, whatever we view, are exposed to, listen to, learn or experience, affects our brains. 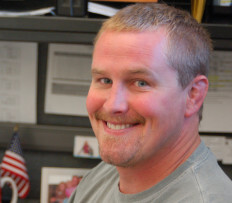 “Post Traumatic Stress Disorder is a natural response to an unnatural event,” said Travis. “The brain’s Amygdala attaches an emotional tag to any experience to remember it. “PTSD is a way of the brain wanting you to remember an event, except it also causes hyper vigilance and low self-esteem and makes those experiencing PTSD not trust others,” said Travis. “Just as experience can change the brain, Transcendental Meditation can change the brain,” he said. “When meditating in TM, the person transcends thought, which allows the brain to reset itself. If affects the body and the mind. A significant event occurred in my life the day I learned that our human physiology, our body, is made of consciousness. “What?? ?” I asked out loud in wonder. I learned that our human physiology is so magnificent and complex, and so exquisite in its design and makeup, as to be wondrous beyond imagination. 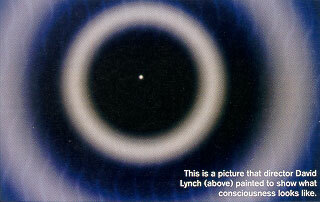 We are spun out of unbounded, infinite, eternal consciousness. I also learned that there is another science called Vedic Science. This Vedic Science is ancient, and it has always talked of the Unified Field. Veda, I learned, means “total knowledge.” The home of total knowledge is the Unified Field. It is also the home of all the laws of nature. The branches of Veda, 40 in total, make up the language of the Unified Field, the impulses of this eternal field. I realized this Unified Field is quite an interesting place. It is not manifest and is full, meaning it is no thing, yet all things in potential. It manifests and permeates all things: the whole universe, everything, while still remaining full and not manifest. Is this mind-boggling or what? Now comes the hippest part. I have learned that any human being can “experience” the Unified Field. Why in the world would we care to experience the Unified Field? Have you ever heard that most of us human beings use only 5 percent of our brain, our mind? Have you ever wondered what in the heck the other 95 percent is all about? This is the beautiful part coming up. The “experience” of the Unified Field actually unfolds “enlightenment”—higher states of consciousness culminating in Unity Consciousness, the highest state of consciousness. These higher states use that 95 percent of the brain. That is what the 95 percent is there for—to give us permanent, all-time enlightenment. Now, what is enlightenment? If you were a light bulb, let’s say, your “glow” might light up your whole house and surrounding yard. In enlightenment, your “glow” would be unbounded, infinite and eternal. That would be some glow! Enlightenment is fulfillment. Supreme fulfillment. Unbounded, infinite, eternal bliss, consciousness, intelligence, creativity, harmony, dynamic peace. Enlightenment, I have learned, is our “full potential.” It is the birthright of every human being to enjoy enlightenment. Is this good news? I think it is such good news. In Vedic Science, the Unified Field is called “Atma.” Translated, that is “Self”—the Self of us all. The Unified Field is not something foreign, or even something far away. It is right within each of us at the base of our mind, the source of thought. A great sage from the Himalayas, Maharishi Mahesh Yogi, brought a beautiful gift to our world in the form of Transcendental Meditation. Transcendental Meditation is an easy and effortless, yet supremely profound, technique that allows any human to dive within and experience that unbounded ocean of pure bliss, pure consciousness, the Unified Field, our Self. It may be interesting for you to know that millions of people are practicing Transcendental Meditation all around the world. People from all religions, and all walks of life. Over 600 studies have been done in universities and research institutes validating the profound benefits of Maharishi’s Transcendental Meditation Program. Having this kind of knowledge and technologies of consciousness available to us in this age is, in my mind, a significant event. Yet the “experience” of that Unified Field is the most significant event, because it unfolds what we truly are—totality. David’s movies include Eraserhead, Dune, Blue Velvet and Mulholland Drive. He is looking forward to Creating World Peace Day, to be held mid-September at the Maharishi University of Management in Fairfield, Iowa (www.mum.edu). Copyright 2004 Fairchild Publications, Inc.
Back to the David Lynch articles page.